During the basic course you learn the basic movements. 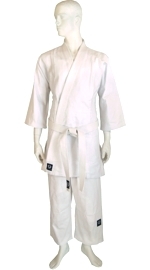 Meijin Budoshop recomends aikido uniform Roku #30335 fir the basic course. 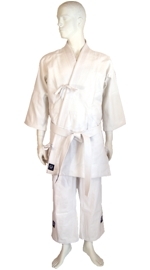 Many advanced aikidoka use the Roku uniform as light uniform for basic aikido training. So if you sweat lot we recomend it. It is 100% cotton so it will shrink about 4% during the wash and if you use drum there might be more shrinkage. Washing at 30-40ˆC turned inside out. If you want to wash with higher temperature you can use 60ˆC seldom. You can wash the uniform at 90ˆC, but there might be even more shrinkage. You should have always clean uniform during practise for comfortness to all. Other option for basic course is #30355 San uniform. It has laces on chest and waist if you dont have hakama to hold your jacket closed. White belt is used 6th-4th kyu, brown belt is optional for 3rd-1st kyu and after that is dan grades with black belts 1.dan, 2.dan, etc. After basic course is grading for 6th kyu and moving to next coursing.You will also learn kata (formal practise with wooden weapons) where you will use wooden sword (bokken or bokuto), wooden stick (jo) and wooden knife (tanto). 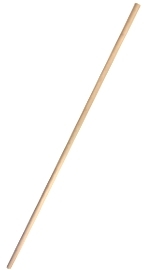 Bokken for adults, both men and ladies, is 102cm and for juniors shorter. High quality wooden weapons will last years during normal practise. You are not allowed to carry wooden weapons on the street so you will need a weapon bag #20006 where you can insert Jo, Bokken and Tanto together. 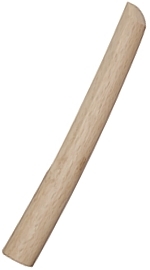 Meijin Budoshop's white oak and red oak japanese Bokken and Jo are durable for aikido. There is no need for any maintainance or sanding the surface of Meijin Budoshop weapons. Some aikidoka use special bokkens like Katori Shinto Ryu have. so called broad pants which were used during riding. After receiving the 3rd kyu you are allows to use Hakama. In Aikido you should have soft back (koshi-ita) plate in hakama. 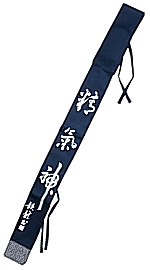 Meijin Budoshop has both blue and black Aikikai hakama or economical AH1 hakama for aikido.If you have AH1 hakama with the spoon attached under the hard back plate you should remove it so you wont have any back injuries. Spoon is used in iaido for holding the hakama up.Aikido hakama has long front laces so you can make the knot to the front side. during 3.-1. kyu brown belt is used and black belt when you reach 1st dan. 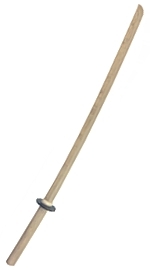 There are special wooden weapons for advanced aikidoka and after gathering experience it is more easy to pick right weapon for yourself like longer Jo-stick. 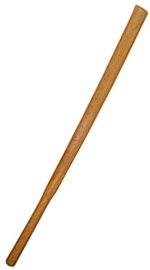 There are some bokken which are for training muscles and/or arm movement. They are called suburi bokken. 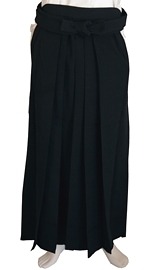 It is wise to get exclusive hakama and uniform for the shows. 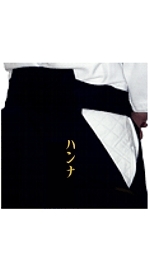 You can get embroidery to your hakama, uniform or belt with katakana. 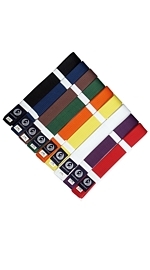 Meijin Budoshop can make separate labels or make embroidery to new uniforms, hakamas and belts.